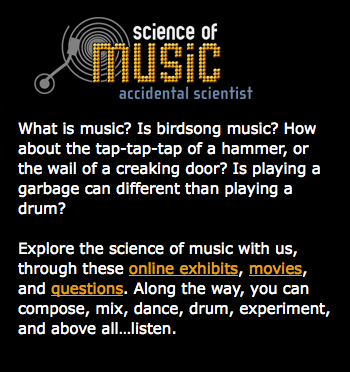 The Science of Music is an online web site with some really fun activities and lessons for musicians and others interested in audio sound. Students and teachers can explore several fun activities like the “sink-o-pation room”, “dot mixer”, “take the beat back”, “online drum circle” , the “headlands experiments” or the “step re-mix”. Science of Music also includes movies and questions about interesting elements of music. Such as, “Why does your singing voice sound better in the shower?” Visit The Science of Music Fun and useful learning all about music.